Cool, edgy and classy. Love the look. And yes, the cross body is it. It is unique too. Well, never full is very popular around here too. Have a lovely week beautiful. No way, the Never Full is popular in Ireland as well? Geez. Whoever designed that tote must have been promoted right away. It’s only Tuesday but the days are moving at a nice pace thank you very much. Hope all is going well with you Mojisola. The sweater is really nice and I absolutely love your statement necklace! Thank you Anett. The sweater needed a little extra something to compliment it. I went with the statement necklace. Loving this casual chic outfit! The trip sounds lovely! Thank you. It’s not to just be relaxed & casual sometimes. I adore all of the pieces together! The sweater and the loafers are my fav! Thanks Chelsea. I literally live in these loafers. They’re on the high-end without a doubt but worth every penny. Lol, thanks Ashley. I was totally ready for sure. I love that sweater, the leather feels really good. I’m going back up to our ski house this wknd again, I hope to get in a few good shots as well. that sweater is so cool! 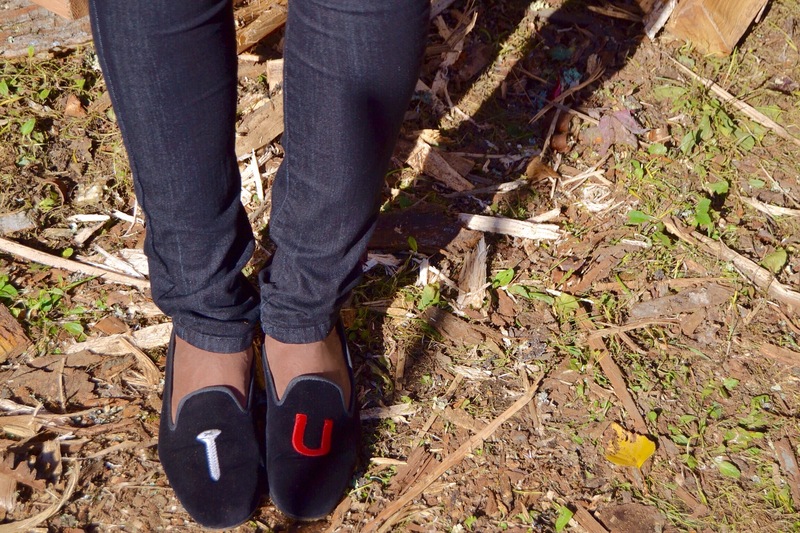 love your monogramed shoes! Thanks Kelsey. Hope all is well. I must visit your blog. It’s been a while. 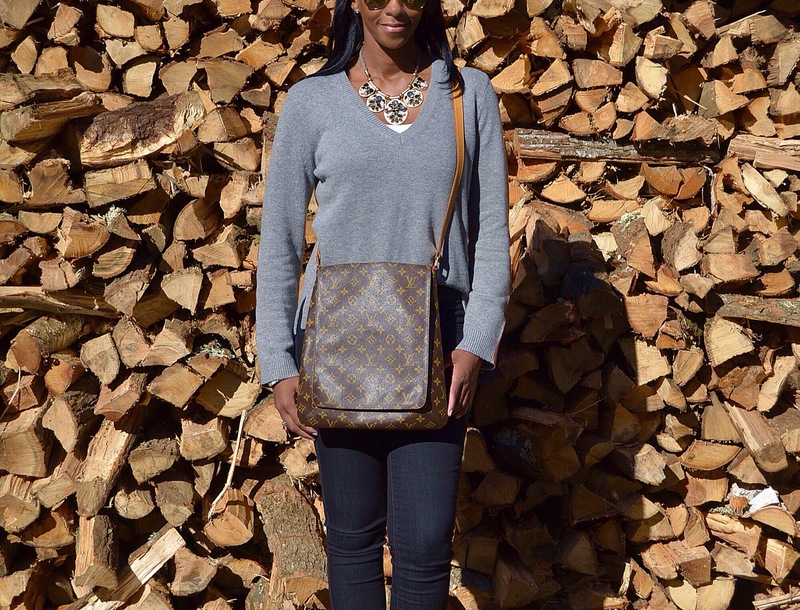 Such a cute casual outfit – love that crossbody!! Thanks Carmen. As for the bag, I have LV luggage that is over 10yrs old. Granted you don’t use luggage as much as you do an everyday bag. Usually my LV’s last me 5yrs before the straps need refurbishing. Thank you so much. Because the outfit is so simple, I HAD to add a little special a touch. I think the necklace did that. Love your outfit!! Nice pics!! 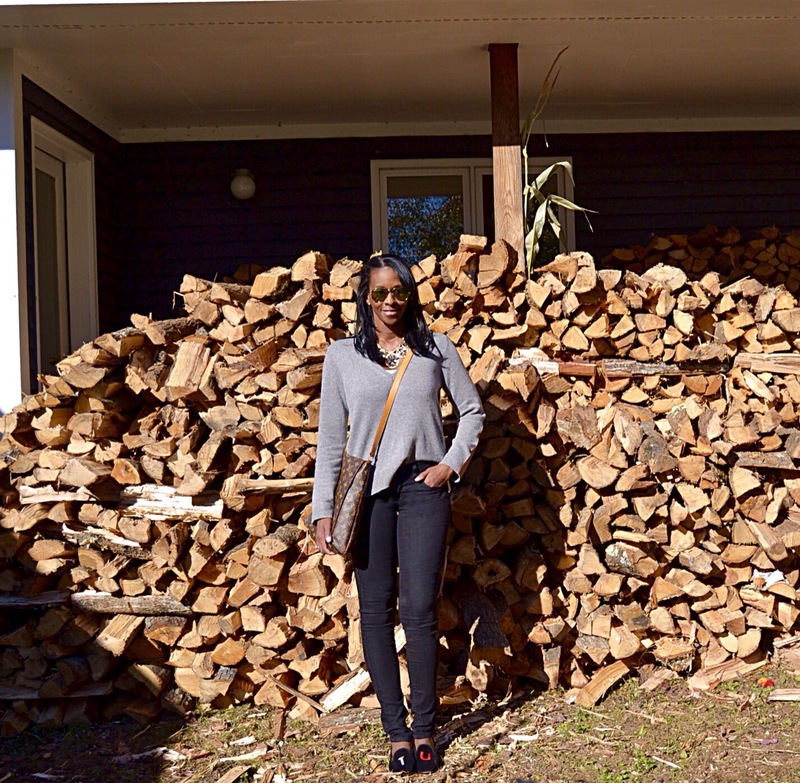 Wow, that is a lot of firewood! You look ready for winter, and I love this casual look. Fun loafers. Believe it or not, there’s even more wood under the back deck. This what we use to mainly heat the house. The fire place on the main floor gives off get heat and is circulated to the main and second floor. The wood burning stove heads the basement. We’re going up to the house again this wknd. It’s going to be 44 degrees, so more would will disappear as well. Such pretty fall photos! I love your classic handbag. Thank you. 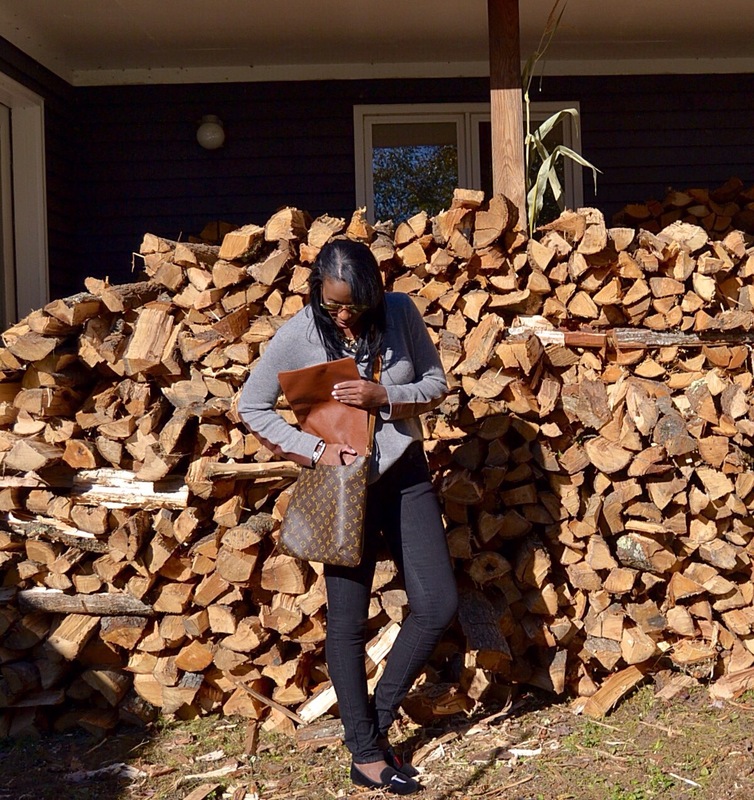 Each season I try to get a few photos in front of all our fire wood. That is before it’s all gone. Thank you Michele. I wear them 5 days a week. I’m sure my co-workers are tired of seeing them. Thank you Kirsztina. Fall is here in NYC but it feels like winter up in Vermont. We went back up again this past weekend and it was 29 degrees and it snowed a tiny bit. I needed more than this sweater. How much fun! Your outfit is perfect for the occasion and I am dying over that sweater! Thanks Jaime. 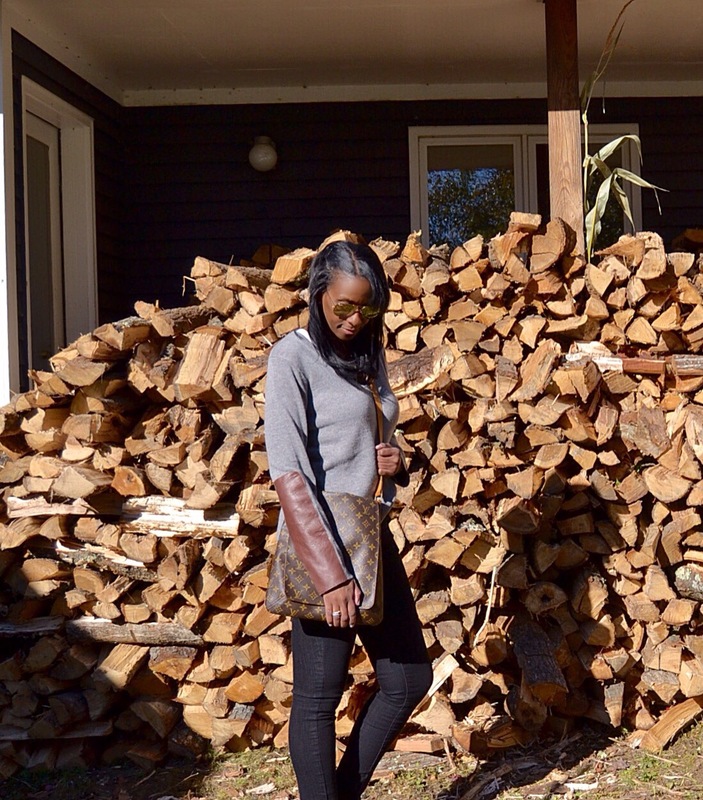 I love a leather elbow patch so this leather forearm knit really got me excited. lovely post, you look so good. This is such a great casual, relax weekend look! It’s perfect! Also, that bag is amazing! Thank you Rachel. LV is my go to bag designer. Cute outfit! Love the sweater, and the necklace makes the look so chic! Thank you Esther. The outfit needed a special piece to keep it from being completely boring. Such a classy outfit and love the shoes, they are so cute and fun! Thank you Nissi. All my LV’s are my babies. This is such a classic chic look and I love the extra special details like the necklace and adorable shoes! Thank you so much Liz. The sweater needed a little something extra.